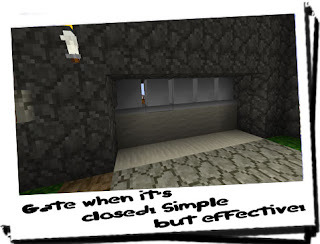 Diary of a Miner: Day 23: A gate to keep out the nasties! I decided today would be a great day to actually fortify my wall with something a little more solid than a wooden barricade. 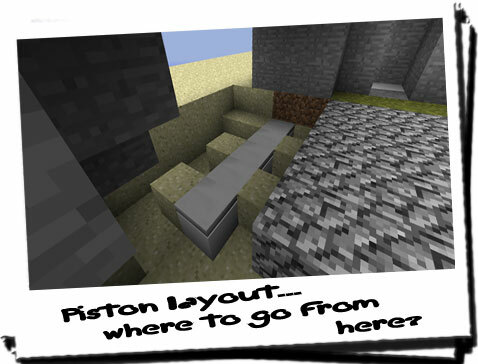 So I drew up plans for a simple redstone circuit gate! I had a few issues with technical drawings because the position of the gate and the thickness of the wall limited my options considerably! Also, as redstone only works when in direct contact with itself or a mechanism that can receive and make use of the charge, placing redundant stuff on top was going to mess with the circuit! This meant either raising the level of the gate, or lowering it. But I had it how I wanted it, and it was wide enough to allow the task force to bring anything in through the walls. So I cheated; instead of a single gate that closes from a single direction, how about it closing from both directions? 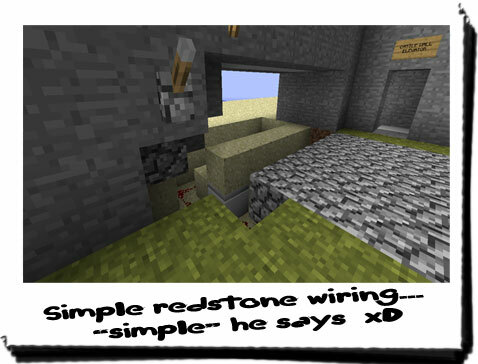 Then I hit another snag in terms of redstone wiring! How would I get the wiring into the wall? Well, after about an hour of technical drawing, I got in a huff and decided to tackle it the manly way: trial and error! 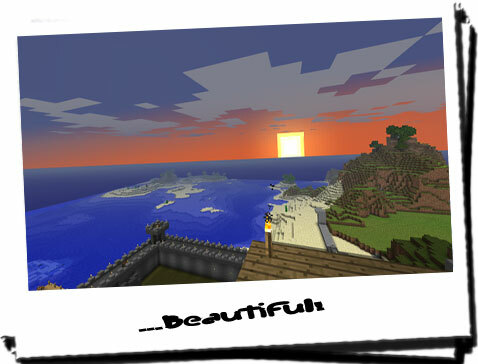 I tore down the wooden barricade and dug up the cobblestone pathway, dirt and sand. I then went back inside to fetch the pistons, one at a time, which took quite a while itself! I then laid them out on the floor in a reasonable position. After laying down some wire, I realised that, without further excavating (and therefore weakening) the path, the pistons would not operate properly because of crossed wires! I soon tackled this problem, like I tackle sudoku in my spare time (spare time? HA!). I alternated the sides that the pistons received wiring. As there were five pistons, two were connected to the redstone on one side, and three on the other. This meant that the charge would reach each individual piston without crossed wires! After affixing a lever to the end of the redstone, I tested it; it worked perfectly! Now all I needed was to do the same thing... But have the pistons coming out of the ceiling. Simple...? After a few hours of teasing, hammering and sacrificing wall, I managed to cement the pistons face down into the ceiling. This would ensure that when I flicked the one lever, the top pistons would reach the bottom, and thus create a gate, or a trap. Once again, I had the issue of crossed wires, but due to the thickness of the wall, I had the freedom to merely extend the wall as needed. Within half the expected time, I had the wiring finished for the top pistons as well, and I was definately ready for a test! After ensuring that the wiring was complete and there were no weak links which might break or have a fault, I re-affixed the lever and pulled it; VOILA!!! I had a fully working gate that would block intruders from entering within my walls! I felt truly safe now; nothing could get into my area without me ensuring it could! After bricking up the wall - paying careful notice where the redstone wiring was - I then filled in the hole and poured sand onto the pistons that rise out of the ground. It was a particularly effective method, but when I flicked the lever, the pistons in the ground would push sand up to meet with the pistons coming from the ceiling. Unless something was really small, or crawling on the ground, it is unlikely to get through. 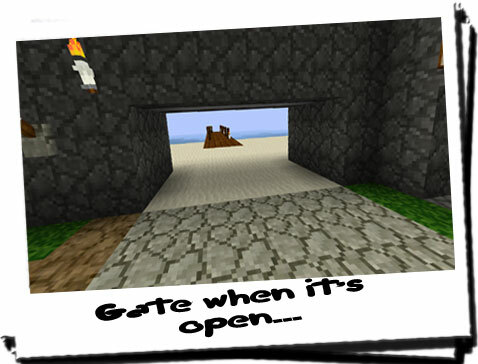 And as Creepers only seem to self-destruct when startled, I was unlikely to awaken to a smoldering ruin of a gate! Off to bed now... Really need to think what I'll be doing tomorrow... Do I dare check out the mineshaft? It's worth a shot... Chances are there's nothing down there... I hope!